In a population initially consisting entirely of cooperators (C; pink) (left graph), the number of defectors (D; blue) rises at about the same time in all locations due to the mutation of C to D. Because all locations are experiencing the same dynamics, D eventually causes the collapse of C and then goes extinct itself. In a population initially seeded with a mixture of C and D (right graph), the population dynamics are more heterogeneous, allowing C to escape to locations made empty by earlier D-induced extinctions. This allows the persistence of both populations and thus the survival of cooperation. Image provided by Dr. Adam Waite. There are two types of people in the world: those who continually give back to their community and those who don't. Now over time you might imagine that those who take but never give, the defectors, would have the advantage while those who give back, the cooperators, would have less energy or resources to spend on securing their own survival and reproduction. In the long run, that often turns out to be true and leads to population collapse as the defectors, the professional moochers, take over and resources become harder to procure. Interestingly however, former Fred Hutch graduate student Dr. Adam Waite and former UW undergraduate student Caroline Cannistra of the Shou Laboratory (Basic Sciences Division) uncovered several mechanisms in which the presence of defectors can actually increase the survival of populations of cooperators in the long run. The results of their study were recently published in PLOS Computational Biology. Instead of experimentally measuring population dynamics, scientists can run simulations of populations with controlled parameters in silico. These simulations can paint realistic pictures of large populations that would be extremely difficult and time-consuming to generate by observing large populations of living organisms. Understanding population dynamics between groups of organisms, such as microbes, is important for understanding natural communities, such as those present in the human gut, as well as for bioengineering applications such as drug or biofuel production. Dr. Waite and his colleagues modeled dynamics of populations of yeast in silico, allowing them to occupy a collection of distinct locations (i.e. a population of populations or "metapopulation"), an arrangement that mimics the patchy distributions of individuals often seen in natural ecosystems. At each location, cooperators released a resource that could be used by all individuals in that location. Defectors used the resource without giving back and cooperators and defectors competed for the released resource. Individuals could occasionally migrate to a different location. A cooperator could mutate into a defector, which commonly occurs through loss-of-function mutations, while the reverse phenomenon is only very rarely observed. 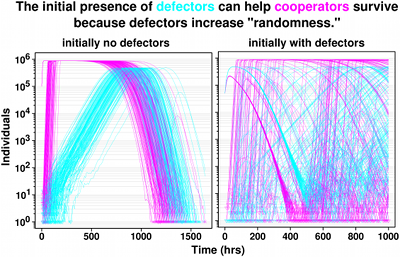 Both cooperators and defectors could evolve to become better adapted to resource limitation. To make their predictions realistic, the scientists used parameters based on experimental measurements of yeast resource consumption and release as well as rates of birth and death of individual yeast cells. They varied other parameters such as mutation rate, migration rate, and the initial presence of defectors to test how these affected cooperator survival. The scientists found that when populations initially consisting of a mixture of cooperators (C) and defectors (D) were not allowed to migrate to different locations, defectors outgrew cooperators and eventually caused the collapse of the entire population. However, when C and D were allowed a moderate rate of migration, the survival of cooperators was greatly improved. This is because C could migrate to "empty" locations where D had caused the sub-population to collapse. In contrast, individual migrating defectors could not "seed" these empty locations without the presence of cooperators. Intriguingly, Waite et al observed that populations beginning with a mixture of cooperators and defectors could sometimes outlive populations initially consisting entirely of cooperators. This is because when defectors were initially absent, all locations shared a similar dynamic: cooperators migrated and grew to high density, then cooperators mutated into defectors at a certain rate and the subsequent rise of defectors caused synchronous population collapse. In contrast, when defectors were initially present the population dynamics across different locations became heterogeneous; some sub-populations collapsed due to defectors, allowing for migrant cooperators to seed and grow with greater initial advantage there than migrant defectors. This type of oscillation between C and D numbers at individual sub-populations appeared many times in simulations with different assumptions and initial conditions, suggesting that it is likely a very common phenomenon. Thus, both the ability to migrate into locations made empty by defector-induced collapse and the dynamic and stochastic nature of the competition between C and D leads to the survival of C over longer periods of time than would be observed without D.
In addition to this, the scientists observed that the deteriorating environment created by defectors selected for mutant cooperators (C*) and defectors (D*) more suited to nutrient limitation. Since these high fitness mutants quickly dominated the entire metapopulation, they had the same effect as dramatically reducing population size. This favored the survival of cooperators (C*) in a way similar to the "chasing" dynamics (Supplementary Movie 2) observed between C and D in migrating populations. "Because they have a selective advantage over cooperators, defectors will always show up in cooperative systems. Usually, defectors are considered exclusively bad for cooperation," said Dr. Waite. "Our work reveals several ways in which the poor environments created by defectors can end up favoring cooperators." Waite AJ, Cannistra C, Shou W. 2015. "Defectors can create conditions that rescue cooperation." PLOS Computational Biology. 11(12):e1004645. This research was funded by the W.M. Keck Foundation, the National Institutes of Health, the National Science Foundation Bio/Computation Evolution in Action Consortium (BEACON), and Fred Hutch.